I saw this Twin Two Twelve (cn 30901) on the apron down at Moorabbin in December 2007. Dave tells me they are in from Canada for the fire season. C-FKGT has been here before on at least one occasion, in late 2005, for firefighting duties as well. From memory, Dave told me the build date was 1978. It is interesting to note the range of emergency gear carried, including the Plank and survival gear and extra sets of headphones, too. They are geared up for a full load of people. 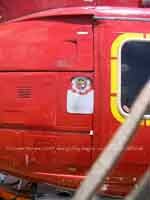 Notice also the mods to the Pilot’s door, the blown window, and that he has a different design of seat from the standard one on the starboard side. The financial arrangements for these choppers must be quite complex. You’d have to take into account the disassembly and reassembly, testing, time out of use while it is on the boat, paperwork so it can fly at each end, cost of having the machine and pilots on standby, plus the hourly cost of running and maintaining the beasts! I’ve been told the dump tank is worth around one million dollars on it’s own, but that seems a little unlikely. I believe the Tahes are flown in on a big Antinov. I guess the balance of down time versus shipping cost works out okay for them. Rear Stbd nacelle. The jetpipes look to have extensions. Intake nozzle for the belly tank. Extra handle on the front door. Engine nacelle. 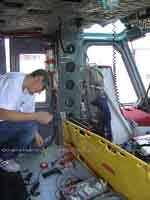 Bell 212 C-FKGT Port rear fuselage. Note that this bird has the un-screened engine covers. Looking across the cabin. Notice the Plank stretcher and fire extinguisher. Profile of the rear fuselage. Profile view of tank front. Note the modified door and blown window to ease downward view when tanking and dumping. The recess in the door is possibly for the same reason. Nose closeup showing mirrors and tank. This shows the “blown” port window well. Underside of nose showing mirrors and antennae.